What Is The First (And Only) Art Installation On The Moon Called? Simpsons's Character Milhouse First Appeared Not In A Simpsons Episode But In? In 1971, the crew of Apollo 15 placed a small sculpture on the lunar surface along with a metal plaque propped up beside it. This tiny sculpture—a little over 3″ long—became the first (and to date only) art installation on the Moon. Prior to the Apollo 15 mission, astronaut David Scott met Belgian artist Paul Van Hoeydonck at a dinner party. Scott commissioned Van Hoeydonck to create a small statuette to commemorate the astronauts and cosmonauts that had lost their lives in furthering humanity’s space exploration efforts. The result of the commission was Fallen Astronaut, a small aluminum figure of simple design that, per Scott’s instructions, is not identifiable as male, female, or any particular ethnic group, but simply as human. 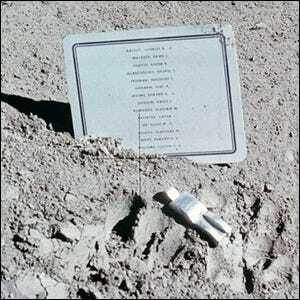 After getting permission from top NASA management prior to the mission, Scott and his fellow astronauts smuggled the statuette aboard the Apollo 15 launch and covertly placed, and photographed, the memorial on the surface of the Moon. Only after returning to Earth did they publicly disclose it at a post-mission press conference. After the disclosure, the National Air and Space Museum requested that a replica be made for public display, which was given to the Smithsonian Institution the following year. It is now on display with a replica of the plaque in the Museum’s National Mall Building in the Space Race Wing, Gallery 114.